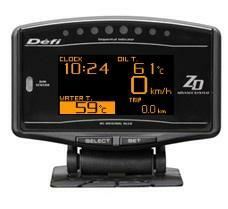 Defi-Link Meter ADVANCE ZD is an OLED multi-display. This product needs to be connected to the Defi-Link ADVANCE Control Unit. By linking to the Defi-Link ADVANCE System, Up to 6 kinds of information is displayed all together in one screen. This product provides information on speed, engine speedd, volt, clock, and so on. 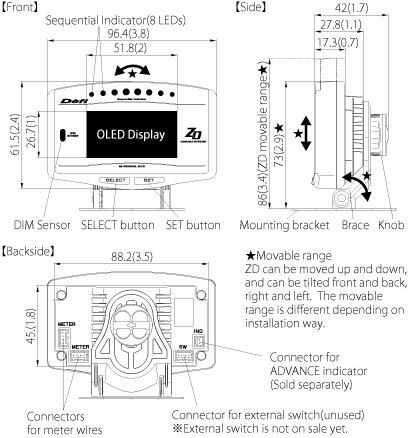 By connecting sensors, oil temperature, water temperature, oil pressure, fuel pressure, and exhaust temperature are also displayed. The display is high-brightness and high-definition OLED made by Nippon Seiki. By connecting this product to the ADVANCE system, the illumination of ADVANCE BF and CR gauges is controlled automatically. Time of 0-100km/h(60MPH) and 0-200km/h(100MPH) can be measured. Warm-up mode is equipped to guard engine. Opening and ending mode can be selected from 2 variations. Self-diagnosis system detects a disconnection of wire, short circuit and communication error, and indicates the error condition. Data obtained during driving (including peak value and warning value) can be stored up to 3 minutes, and the data can be replayed after driving. When both fuel pressure sensor and turbo sensor installed, differential pressure can be displayed. The display items and the layout can be changed. Equipped with sequential indicator with 8 LEDs. Equipped with clock and alarm functions. Mounting angles are more flexible than conventional products. Oil, water, and exhaust temperatures can be displayed from 0 (32). Graphic animation plays during idling (Special mode).